This gammon joint is spot on for a family meal. We cure organic pork, then air dry it for maximum flavour and tenderness. It’s easy to cook – roast gently, adding a glaze of your choice for the last half hour of cooking. Mustard or citrus flavours go beautifully. Add buttery mash and steamed seasonal greens and you’ll have a fine lunch on your hands. 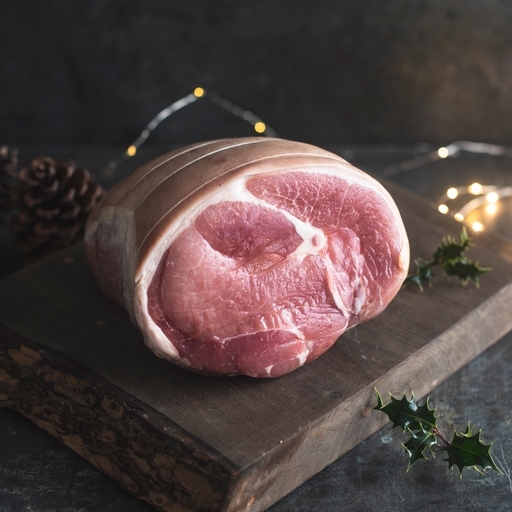 Our gammons don’t need soaking overnight as they have been cured to be ideally seasoned. To cook you can choose to bake or poach. To bake, lightly oil, wrap in foil and bake at 170℃/Gas 3 for 55 mins per kg. To poach, simmer the gammon in a deep pan of water with veg, herbs and spice (onion, leek, celery, carrot, parsley, a few black peppercorns) for 45 mins per kg. To glaze, remove the skin and lightly score the fat. Add your chosen glaze and bake in a hot oven (approx. 220°C/Gas 7) for 20-30 mins, until golden brown. Keep in the fridge and use by the date on the label. If you’re not going to eat it straight away, freeze on the day we deliver and it will keep its flavour and tenderness for up to 6 months. Once frozen, defrost thoroughly and eat within 24 hours. Don’t refreeze once you’ve thawed it. Our organic pork comes from Helen Browning at Eastbrook Farm in Wiltshire. Helen set up her farm over 27 years ago. She’s a champion of organic farming and giving animals the best quality of life – in fact, she’s Chief Executive of the Soil Association and spends much of her time campaigning for better animal welfare. Pork leg, salt*, sugar, preservative (sodium nitrite*), antioxidant (sea buckthorn). Prepared in a kitchen where milk and oat are also handled.